One of ur favourite pieces of chicken is chicken wings. We do enjoy cooking whole chicken, but we never buy pure chicken fillet. Primarily because we don’t enjoy having such protein heavy pieces of meat in general and it is also just unnecessarily expensive for what you get. Chicken legs and chicken wings however is something that we do enjoy a lot. Firstly it is a lot of super tasty skin relative to the amount of pure meat and secondly it is also quite a lot of bones, that can be saved for our bone broth making. 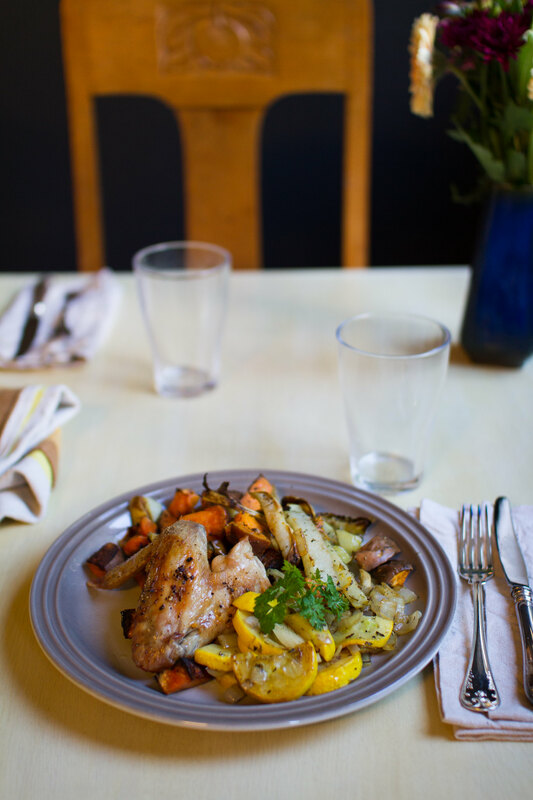 Oven grilled chicken wings with roasted vegetables and fried onion and yellow zucchini. 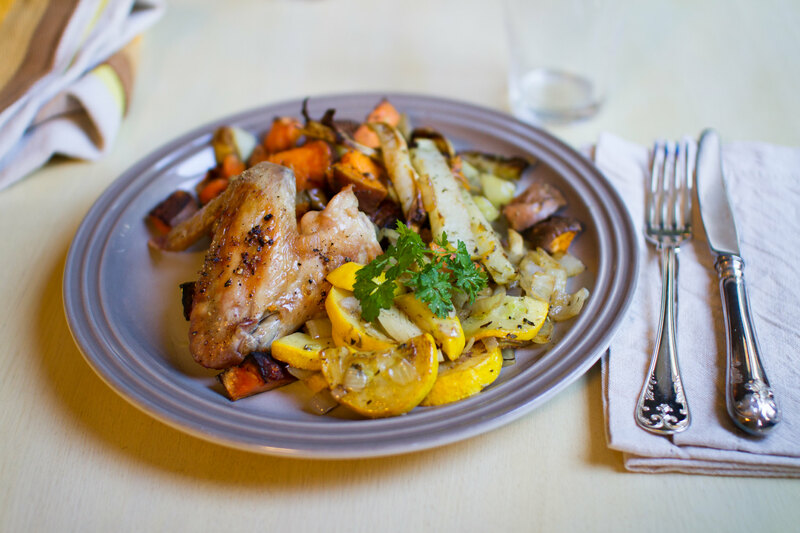 This time we decided to grill the chicken wings together with some sweet potato and kohl rabi in the oven. First we put them in some ovenware and seasoned with salt and pepper. Some butter on the chicken wings and some coconut oil on the vegetables to keep them from getting dry and to add some extra flavours since most flavours are dissolved by fat and it will consequently be easier for us to enjoy all the wonderful tastes and flavours of the food when having an appropriate amount of fat together with it. 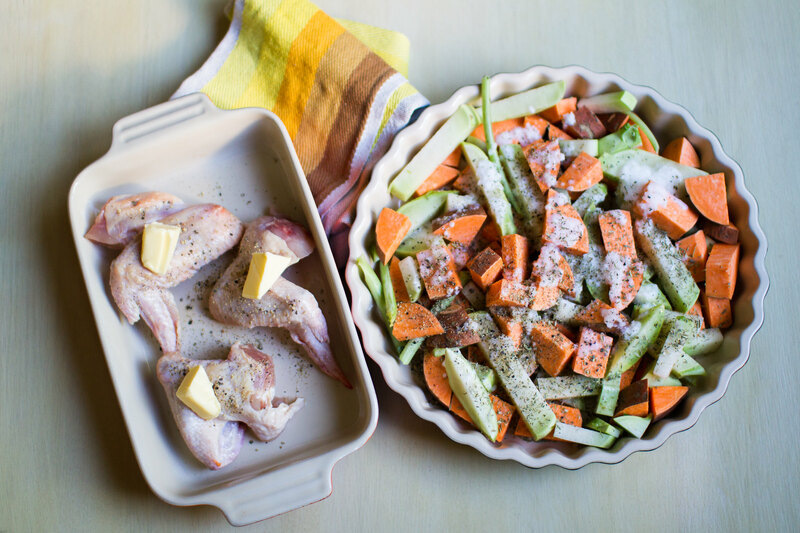 The chicken wings and sweet potato and kohlrabi ready for the oven. After putting the vegetables in the oven at 215 °C we started chopping some yellow zucchini, garlic and onion for frying. To have as a second side dish. 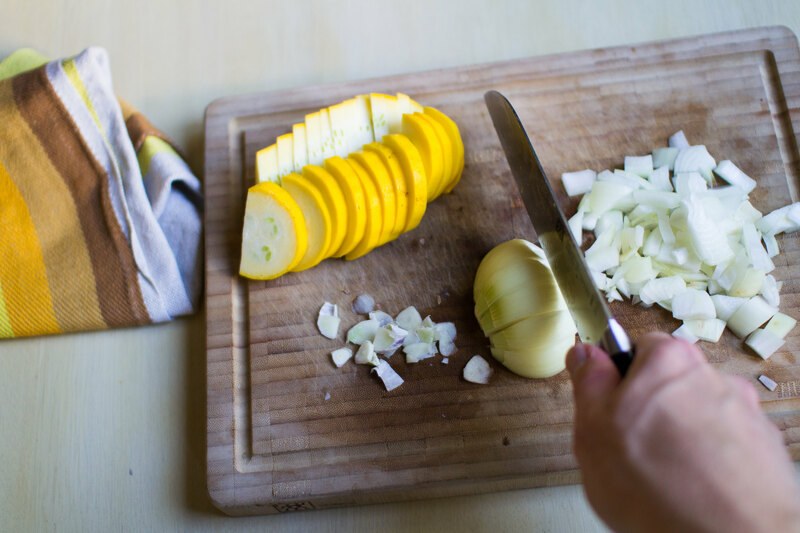 Chopping some onion, garlic and yellow zucchini. After 20 minutes we put the chicken wings in the oven together with the vegetables and let them cook for another 20 minutes. Before serving with the fried onion, yellow zucchini and garlic. Garnishing it all with some fresh coriander.